In part 3, the operating system and drivers were imported into the Deployment Workbench. 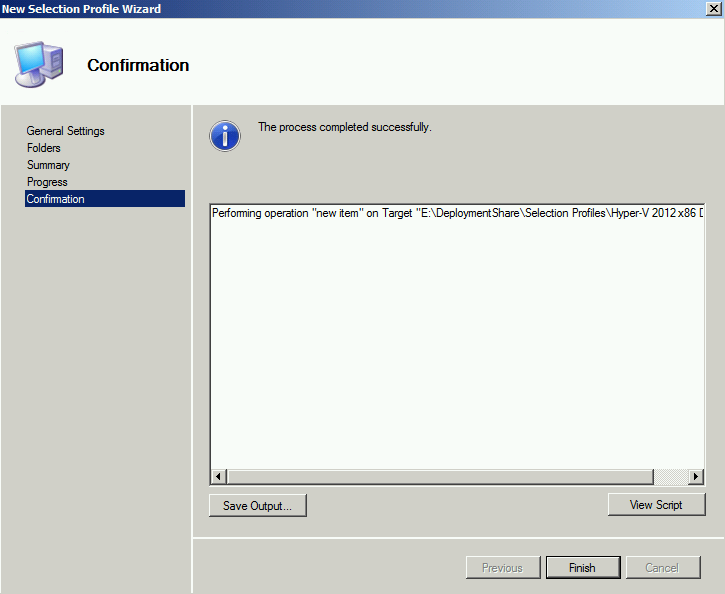 In this part, I will create a new driver profile and task sequence for deployment. 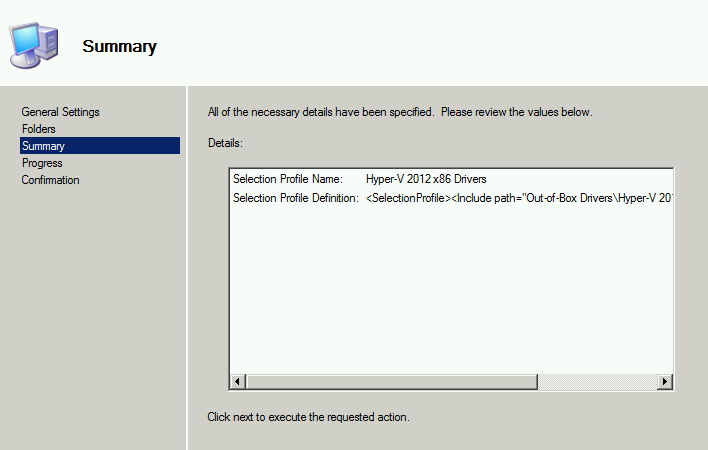 Creating a driver profile, it is for us to manage drivers and apply to difference scenarios. A driver profile can be applied to Windows PE and Windows to inject drivers. We can create multiple driver profiles for different hardware brand or different virtualization environments. 3. 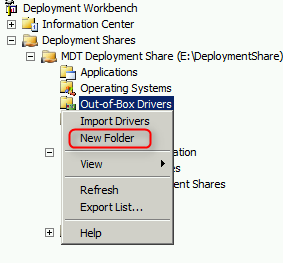 Expand "Deployment Share > MDT Deployment Share > Out-of-Box Drivers". 4. Right-click "Out-of-Box Drivers", select "New Folder". 5. On "General Settings" of "New Folder" window, next to "Folder name", enter "Windows PE x86 Drivers". 7. On "Summary" window, click "Next". 8. On "Confirmation" window, click "Finish". 9. Repeat step 4 - 8 to create a folder named "Hyper-V 2012 x86 Drivers". 10. On central pane, select all drivers. 11. Next to "Actions" pane, select "Cut". 12. Paste all drivers to "Hyper-V 2012 x86 Drivers" folder. 13. 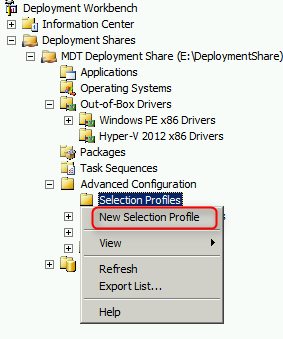 Navigate to "Deployment Share > MDT Deployment Share > Advanced Configuration > Selection Profiles". 14. Right-click "Selection Profiles", select "New Selection Profile". 15. 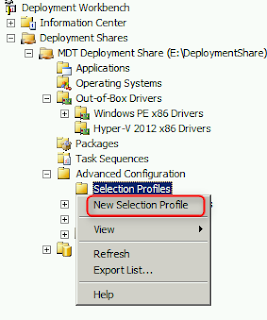 On "General Settings" of "New Selection Profile Wizard" window, next to "Selection profile name", enter "Hyper-V 2012 x86 Drivers". 17. 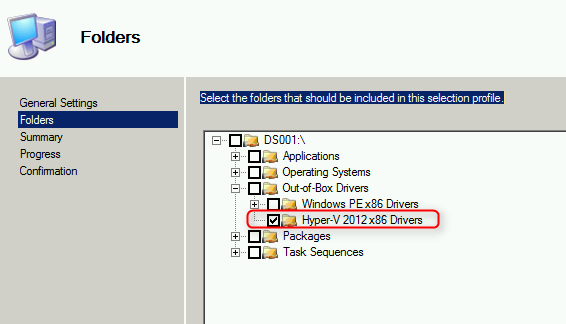 On "Folders" window, check "Hyper-V 2012 x86 Drivers". 19. On "Summary" window, click "Next". 20. On "Confirmation" window, click "Finish". 21. Repeat step 14 - 20 to create a profile named "Windows PE x86 Drivers" which includes "Windows PE x86 Drivers" folder. 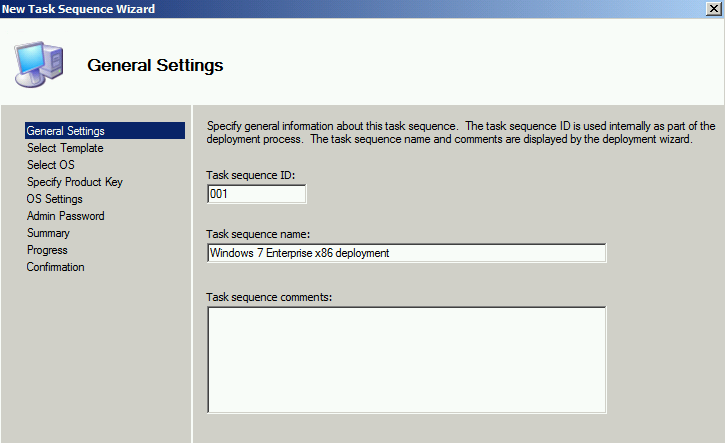 Task Sequence is applied to control the deployment of Windows. 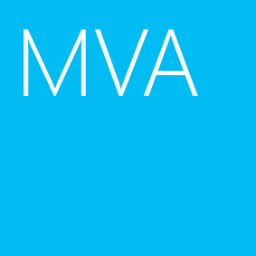 Windows will follow the task sequence to inject drivers, install applications , and so on. 4. 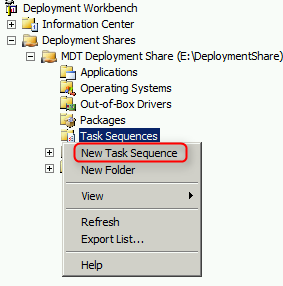 Right-click "Task Sequences", select "New Task Sequence". 5. 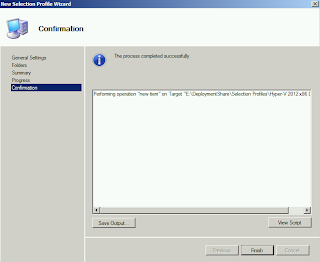 On "General Settings" of "New Task Sequence Wizard" window, next to "Task sequence ID", enter "001". 6. Next to "Task sequence name", enter "Windows 7 Enterprise x86 deployment". 8. 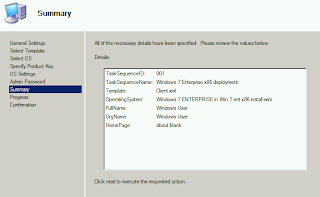 On "Select Template" window, select "Standard Client Task Sequence". 10. On "Select OS" window, select "Windows 7 ENTERPRISE in Win 7 ent x86 install.wim". 12. 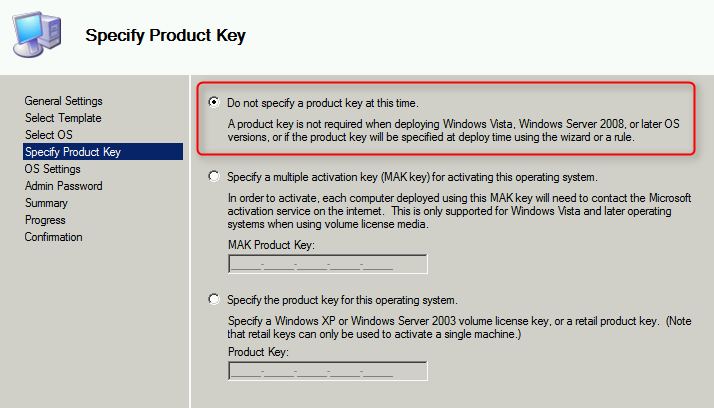 On "Select Product Key" window, select "Do not specify a product key at this time". 14. On "OS Settings" window, enter "Windows User" under "Full Name" and "Organization". 16. On "Admin Password" window, select "Do not specify an Administrator password at this time". 19. On "Confirmation" window, click "Finish". As a result, the task sequence, 001, was created for deployment.